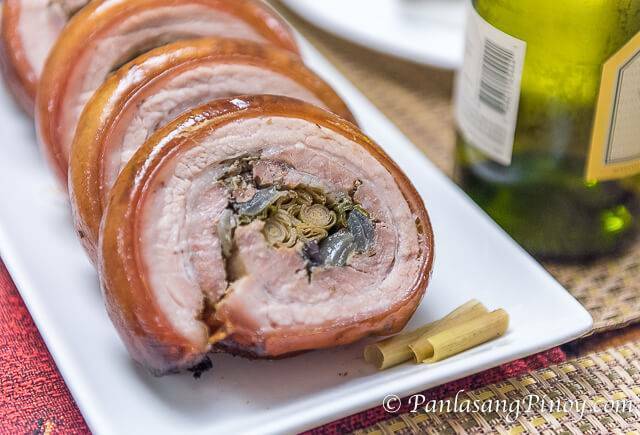 This coming holiday season, give your noche buena or media noche spread a different twist by adding lechon pork belly. Unlike the traditional pork lechon, lechon pork belly is cooked using the oven instead of roasting it over a bed of hot charcoal. Aside giving your family a sumptuous treat, you can also sell lechon pork belly to your relatives, friends and co-workers this holiday season for extra income. Here’s a simple foolproof recipe according to Panlasang Pinoy. Lay the pork belly on a flat surface making sure that the skin is facing down. Rub salt and pepper all over the meat part and allow it to stand for 15 minutes. Put lemongrass, onion slices, and scallions on meat side of the belly. Roll the side where there is lemongrass all the way to the opposite to form a spiral shape. Using a kitchen twine, tie and secure the rolled pork belly. Rub the oil all over the skin. Put the pork belly in a roasting pan and roast for 2 hours. Remove the pork belly from the oven and brush with fresh milk. Place it back in the oven and roast for 30 minutes or until the skin is brown and crispy. After removing from oven. allow it to cool down for 15 minutes before serving.